In 1945, Charles Hampton, the Provincial Bishop in America, told his priests to treat Theosophy as optional. He maintained that it was always intended by the founders of the Liberal Catholic Church to be separate and supplied quotations to prove his point. The Presiding Bishop, F. W. Pigott suspended the American Provincial Bishop. The Provincial Bishop and the majority of American priests, bishops, and parishioners, sided with their Regionary Bishop. They said the word "Liberal" means free. The Americans severed ties with the British church, as did some other groups in Europe. Now maintaining that Theosophy is optional, not required, they formed The Liberal Catholic Church International, which was ruled to be the legal Liberal Catholic Church in America. 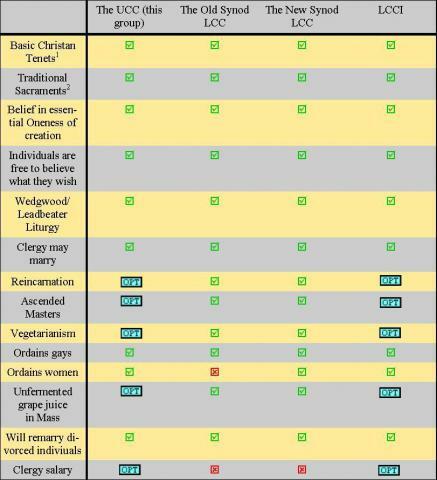 Portions of the LCCI later reorganized as the Universal Catholic Church. The web page you are reading is from the group that keeps Theosophy as optional only, not required. 1 The Holy Trinity, a Presence of our Lord in the Sacrament of the Altar, etc. 2. Baptism, Confirmation, Eucharist, Absolution, Matrimony, Holy Orders, and Unction.